The Central Illinois Percussion Ensemble consists of percussionists from both the Youth Symphony and Concert Orchestra and was formed during the 1997-1998 season. The mission is for students to perform percussion ensemble literature that not only showcases the percussion section and its players, but allows them to enhance their performing abilities. ​Peggy Jo Bonner is known in Central Illinois for her exemplary and versatile percussion skills. Currently, she teaches percussion at Bradley University where her duties include: private lessons, percussion ensemble and percussion methods class. 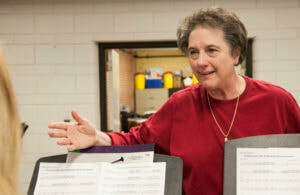 In addition, she directs the Central Illinois Youth Symphony Percussion Ensemble and maintains a large private studio. Peggy is a long-standing professional musician and is principal percussionist with the Peoria Symphony Orchestra for the past three decades where she has an endowed chair in her name. She also is the principal percussionist with the Knox Galesburg Symphony for the past 30 years. She has performed dutifully with the Peoria Municipal Band, Prairie Wind Ensemble (charter member), Opera Illinois, St. Mary Cathedral Choir/Orchestra, Peoria Players Theatre, Cornstock Theatre, Eastlight Theatre, and countless others when called upon. Peggy is the first call percussionist when national touring musicals perform at the Peoria Civic Center. She has played professionally for Wicked, Hair Spray, Mary Poppins, and many others. Peggy graduated from Bradley University and served as band director in Central Illinois, serving Peoria Public Schools. While at Rolling Acres Middle School and Roosevelt Arts Magnet School her concert and marching bands consistently earned top ratings at both district and state levels. In the summers Bonner led the Peoria Park District Summer band program, a traveling award-winning program she participated in as a teen under the direction of long-time director/mentor Fred Huber. Peggy is active as a clinician and adjudicator for area schools.